Premiers April 4th, 2019 at 7pm. Additional showings: Friday April 5th at 7pm and Saturday, April 6th at 1pm and 7pm. Tickets go on sale Valentine's Day! Visit the Ticket Page to purchase tickets online. Or buy your tickets at the door. 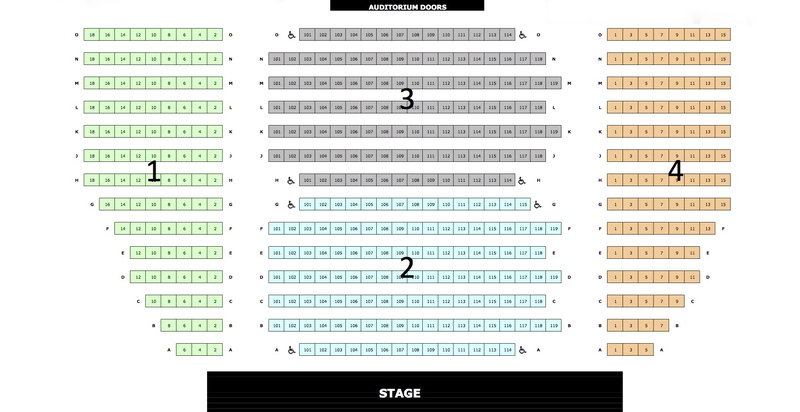 Online tickets close 24 hrs before each performance. Contact Melissa Poppe, mpoppe@wcpss.net, if you have any questions. 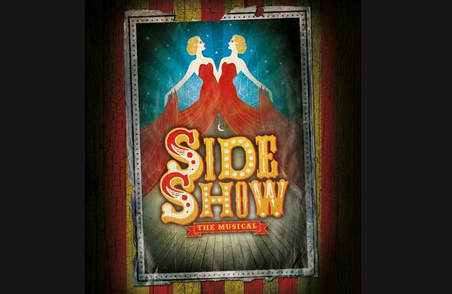 ​Come one, Come all to see Green Hope High's rendition of the award winning Broadway musical--Side Show! Visit our world under the big top to experience a true story about life's oddities through song, dance and the struggle for acceptance. Follow the lives of Daisy and Violet Hilton, a pair of Siamese conjoined twins, as they journey to find social tolerance and love. If you enjoyed The Greatest Showman, then this is the musical for you! Performances are April 19, 20 and 21 at 7pm with a 1pm matinee on April 21. Tickets go on sale March 3rd! Buy them online ahead of time at http://www.greenhopefinearts.org/ or at the door before the performance. Online tickets sales close 24 hours before each show. Box Office opens an hour before the performance. See information below for times and prices. This show is rated PG. A magnificent musical that explores humanity and love, with lots of visuals and strong vocals. Enjoy a delicious dinner catered by Lugano's before the performance or join us for the show only. See A Midsummer Night's Dream on Thursday, April 20 and Saturday, April 22 with dinner seating at 6 PM and general admission seating at 6:40 PM! Purchase your tickets TODAY at https://ghhsfab.myschoolcentral.com! See A Midsummer Night's Dream on Thursday, April 20 and Saturday, April 22 with dinner starting at 6 PM and the show starting at 7 PM! Purchase your tickets at the door beginning at 5:45 PM. 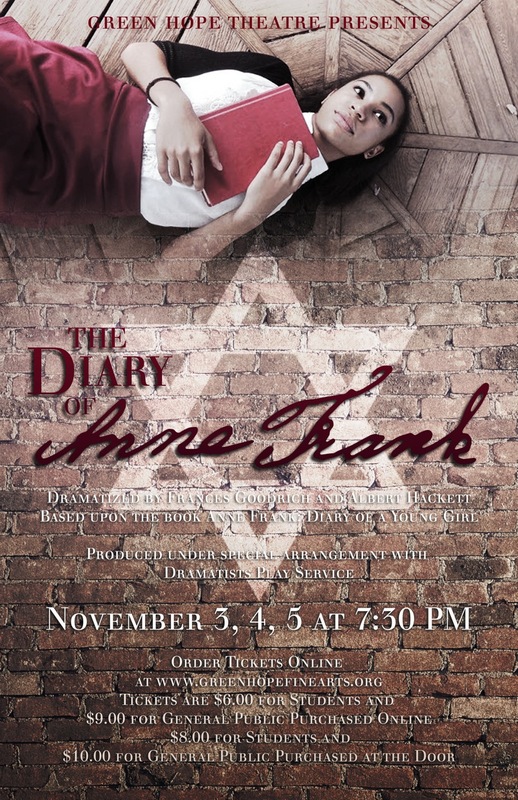 Green Hope Theatre proudly presents The Diary of Anne Frank, based on the book Anne Frank: Diary of a Young Girl, dramatized by Frances Goodrich and Albert Hackett. The play follows the true story of a young Jewish girl who, with her family, went into hiding in Amsterdam to survive the Holocaust. The play is told through an energized and courageous cast who truly hopes that audiences will walk away not only knowing Anne’s story, but also appreciating the human condition of finding the good and keeping hope, even in the most horrific of circumstances. ​The Diary of Anne Frank is produced under special arrangement with Dramatists Play Service. Ten more spots are now open for the Green Hope Theatre 2017 Tour to London and Stratford! Interested? Please enroll at http://www.eftours.com/1757386FS or email jgorski@wcpss.net ASAP. Jamie Gorski was born and raised in Eagle River, Alaska. Aside from being a family man, Gorski has devoted his entire life to theatre and teaching. Throughout his childhood and adolescent years, he trained in summer theater conservatories and went on both domestic and international play tours. In the spring of 1998, Gorski auditioned and was accepted as a performance major at the University of Evansville, Indiana. Throughout college, he played many roles on stage, which included contemporary, classical, and musical productions. He spent a semester abroad studying British History, Classical Theatre, and Shakespeare at the Harlaxton College in Grantham, England. In addition to his collegial studies, Jamie worked as an actor in repertory theatres during the summer months. After undergrad, Gorski took a break from the theatre world to pursue his second passion of teaching. He started teaching middle school and high school English in North Carolina. In 2007, he got his masters degree at Elon University and also started writing children’s theater plays. Jamie currently has plays published with Playscripts, Inc. in New York, and his plays have been performed in 26 different states as well as Canada. In 2008, Gorski started an after school theater program for middle school students in Hillsborough, NC. The program grew to such a success, that his four-year run as artistic director culminated in the construction of a multimillion-dollar performance auditorium. Jamie currently serves as the drama teacher for Green Hope High School where in addition to teaching his course electives, he produces and directs three shows a year, travels abroad with students both domestically and internationally, and advises the International Thespian Society, Drama Club, and Improv Team. How to Succeed in Business Without Really Trying Received 4 awards (out of 13 nominations) at NC Theatre's 1st Capital Awards on May 21, 2007 in Raleigh: Outstanding Choreography, Outstanding Featured Performer (Kelsey Meyers), Outstanding Supporting Actor (Josh Decker), and Outstanding Supporting Actress (Emily Kester). The Music Man received the 2009 NC Theatre Capital Awards for Outsanding Scenic Design and Outstanding Costume Design. FAME Received the 2010 NC Theatre Capital Awards for Outstanding Musical, Outstanding Direction, Outstanding Orchestra, Outstanding Stage Crew and Technical Execution, and Outstanding Leading Actress (Katie Finan). Visit our Gallery for photos.